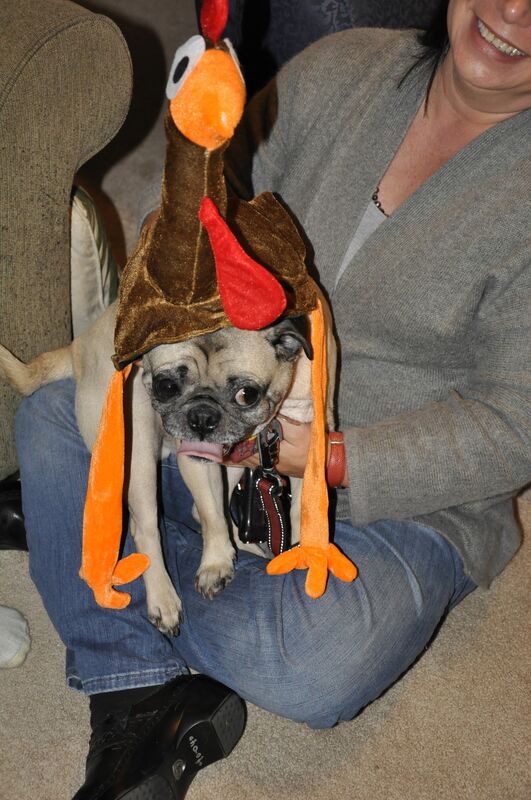 This is Aunt Deb’s “Before” turkey hat. It kind of looks like it’s eating me, doesn’t it? 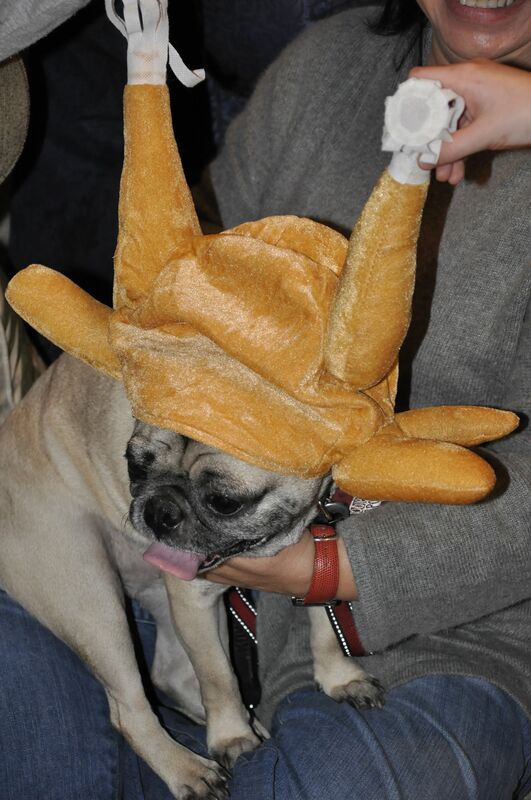 Here I am with Aunt Kate’s “After” turkey hat. This one isn’t so scary. Aunt Andee was there. She was showing us photos of her greyhounds. They’re beautiful animals – if you like those long-legged sleek kinds of dogs. 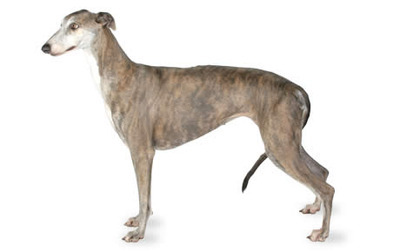 Here’s a photo of a greyhound. You can see how slim their waists are. Cousin Craig and I wonder where they put their organs. There’s hardly any room in there. Maybe Aunt Andee can answer our question. I don’t have to worry about that. I’m pudgy with plenty of room so my organs aren’t squished. The best is our group shot. I’m sitting in the front with the other kids…..I don’t know why I’m the only one who has to sit on his mom’s lap. So I guess that’s all there is for now. Until we meet again….I’m Pugsley signing off. Hi friends. This has been such a sad week. 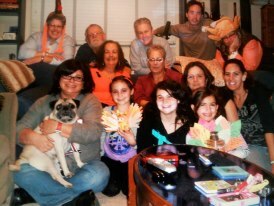 My Aunt Kelly’s mom and Aunt Sandy’s sister Ileen passed away last Friday. Her funeral was Monday and my mom said it was a beautiful service for a beautiful woman. I wasn’t allowed to go. The last time I went to the cemetery with mom to see my pop-pop, I tinkled on my grandmom’s plaque so she thought it was best if I stayed home. My godsister Maya and Aunt Sandy wanted me to come play with them, especially since Aunt Sandy once had a pug named Pugsley, so mom brought me with her to the Shiva tonight. I sat Shiva for my pop-pop so I knew what it was about. Or so I thought.In case you don’t know, Shiva is the seven-day mourning period for the immediate family of someone who has passed away. There are a lot of ancient rituals that take place – and I think we made up some new ones. The minyan is a prayer service that’s held each night and 10 Jewish adults are needed. Since I have four legs, I think I count twice. All males wear yarmulkes (skullcaps) during prayer as a sign of respect to god. Aunt Kelly and Aunt Sandy got me ready for the service. 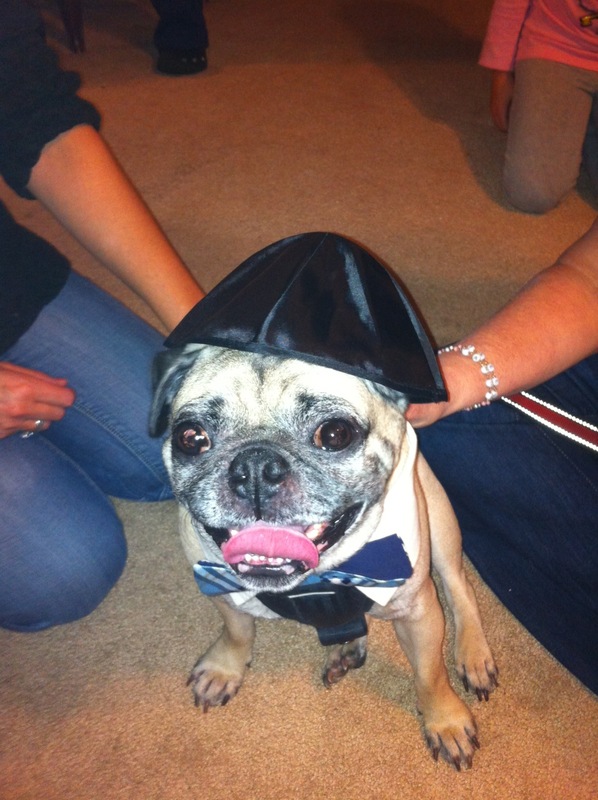 I think I look quite handsome, but I don’t think I have the right shaped head to wear a yarmulke. The readings are a loving tribute. At one point all the kids laughed at me. They thought I was snorting, but I was just praying like everyone else. We all do things in our own way. After the service Maya gave me dinner and took me for a walk. I love her so much, but she wears me out. She likes to run and run and run…..I prefer to walk at my own pace and stop every so often to sniff a plant or a tree. I have to be quick when Maya walks me; she doesn’t like to dilly-dally. While we were out walking, Aunt Sandy and Uncle Drew started the entertainment portion of the Shiva. We didn’t have entertainment at my pop-pop’s Shiva so I didn’t know exactly what to expect. Then I saw all the kids with balloon animals and hats. Aunt Sandy used to be a clown for parties and Uncle Drew is a clown for the Shriners. I’m kind of glad they weren’t dressed up while we were there. I don’t know if I like clowns, but I LOVE balloon animals so I got in line to get mine. All of a sudden they weren’t sure if I was a kid or an adult so do you believe they asked me for ID? I told them I didn’t want to vote, I just wanted an Elmo hat. And who cares if I’m an adult? My inner puppy wanted a balloon. 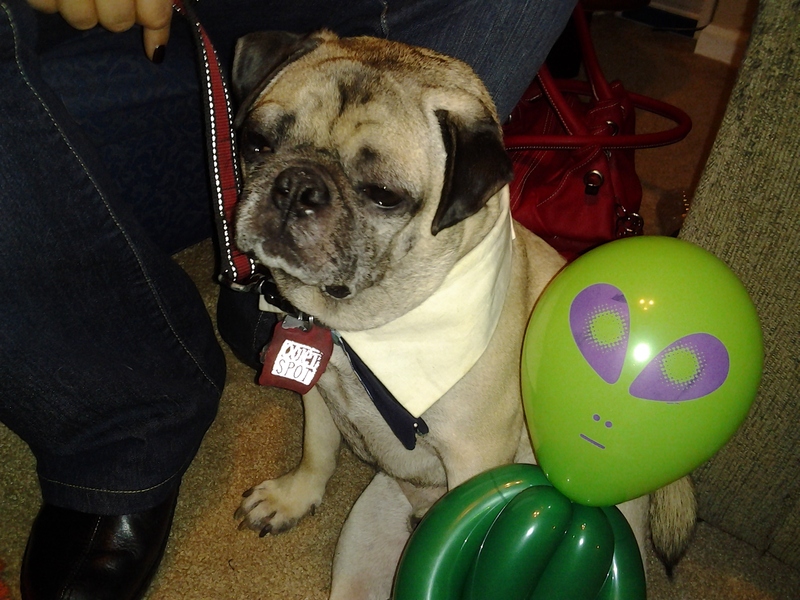 Again, my canine head was not conducive to the headwear so I got a duckie and a martian. I love my duckie, but a martian? Really Aunt Sandy? Do I look like I want to have nightmares about little green men taking me into their spaceship? Although, I guess if my dreams are real enough I could go on Ellen’s show. I would totally dance with her! Then I could go on Dancing With the Stars. I’ll bet I’d look super handsome with a spray tan. Yes, I think I’ll dream about dancing instead of aliens. Here I am with my balloons. It’s past my bedtime so I’m going to snuggle with mom in case the martians come for me. I know what a sad time this is for the Green/Wright family so mom and I promise to be there for Aunt Kelly, Aunt Sandy and Maya when they’re feeling blue. 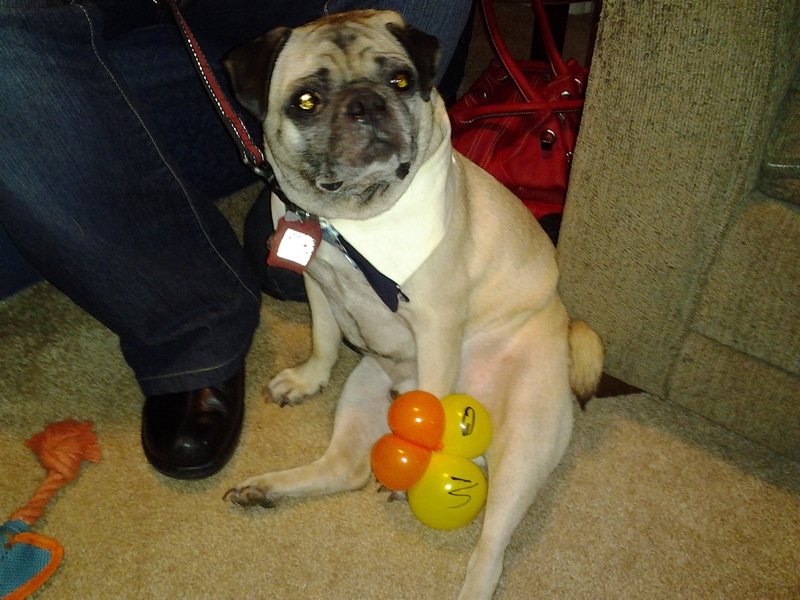 Afterall, who can be sad when a pug with a balloon duckie is in the house? I just have to brag….whose mom rocks???? My mom’s busy at 6abc today answering voter questions and concerns. From what I saw on the news, there’s a lot of weird stuff going on. It’s going to be a late night friends. Good thing I have snacks for later. Tune in to 6abc for more details.